Rockwool is a substance formed by melting a mixture of rock and sand, and the mixture is spinned to make fibers in different shapes and sizes. Rockwools are used to retain water and air, thereby maintaining the cleanliness of the environment. Cultilene is a company who has been manufacturing the Rockwool products for years now. Most of the industrial companies prefer the products of Cultilene. 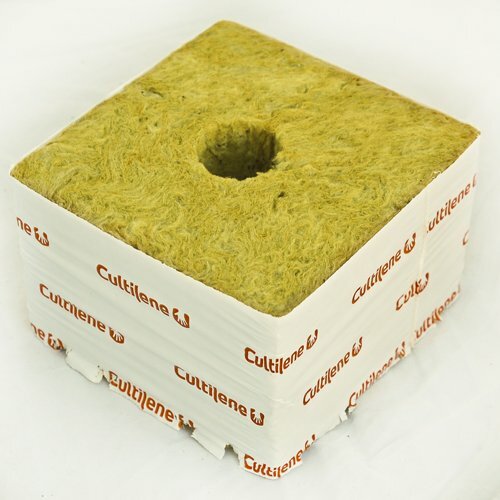 The 6 x 6 x 5.3 Cultilene Rockwool Blocks is one of the types of Rockwool available from the store of Cultilene. Quantity – There are about 48 Rockwool blocks available in the 6 x 6 x 5.3 Cultilene Rockwool Blocks package and it is priced on the basis of per case box. Rooting – Continuous and constant rooting is provided by the 6 x 6 x 5.3 Cultilene Rockwool Blocks. Even distribution of water and EC proves very beneficial to this too. Water absorption – The air/water ratio needed for the roots to growth healthily is optimum as the 6 x 6 x 5.3 Cultilene Rockwool Blocks is a great water absorbent. Resaturation rate – The 6 x 6 x 5.3 Cultilene Rockwool Blocks also has an excellent resaturation rate which is very much essential for a hydroponic system. Plant Comfort fiber structure – This Plant Comfort fiber structure provides an excellent air to water ratio. This fiber structure can hold water for a longer period and also provides less resistance for the roots of the plants to grow in. The 6 x 6 x 5.3 Cultilene Rockwool Blocks also promotes the initial rooting of the plants at a quicker pace and guarantees firmness. Optiplus feature – Optiplus includes a number of organic acids that provides water stability. The excess water is put out immediately and it also provides better aeration and reduces the root damage. It also promotes the root growth stimulation.